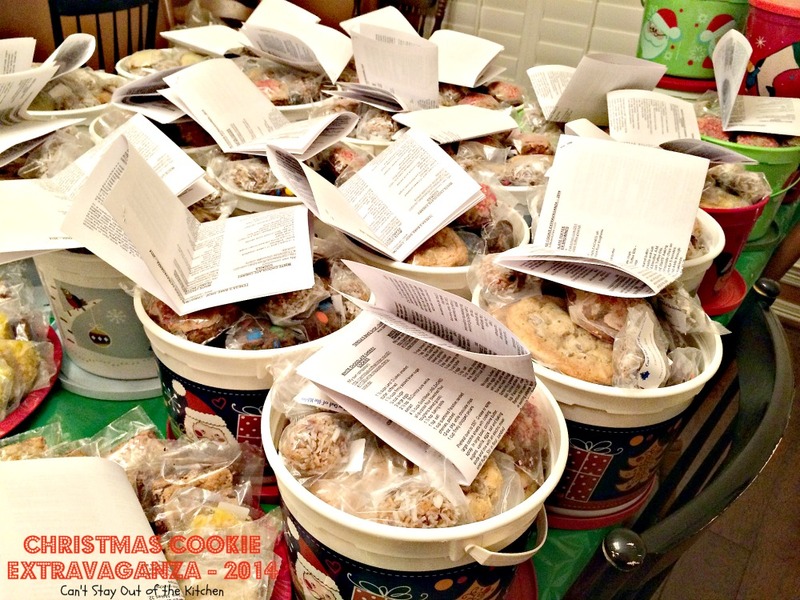 Christmas Cookie Extravaganza – 2014 is here! For the past 36 years John and I have baked Christmas cookies for friends, family members, co-workers, neighbors, service providers, our Sunday school class, Church staff and others who’ve made it to our Christmas cookie list. We enjoy providing these goodies but it is a LOT of work. 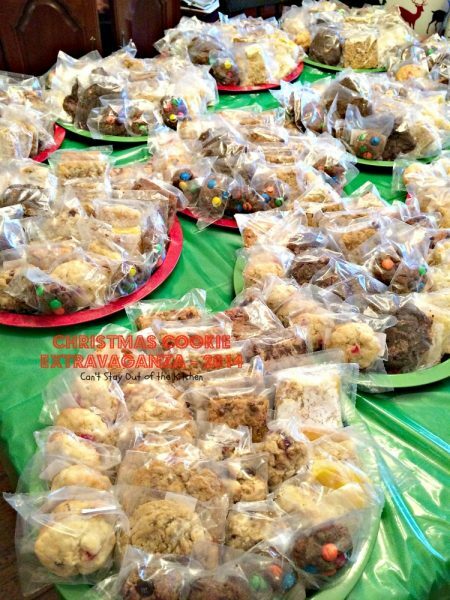 I thought I would take you through the process we go through, as well as show you each of the cookies we made this year. 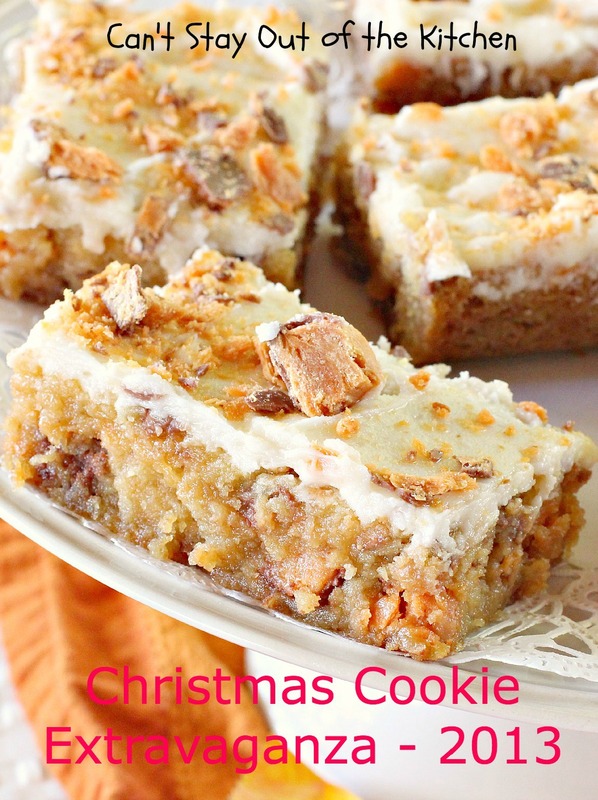 I remade a lot of cookies this year from cookies I previously posted on my blog so I could get some better looking pictures than I originally took back in the early days of my blog. 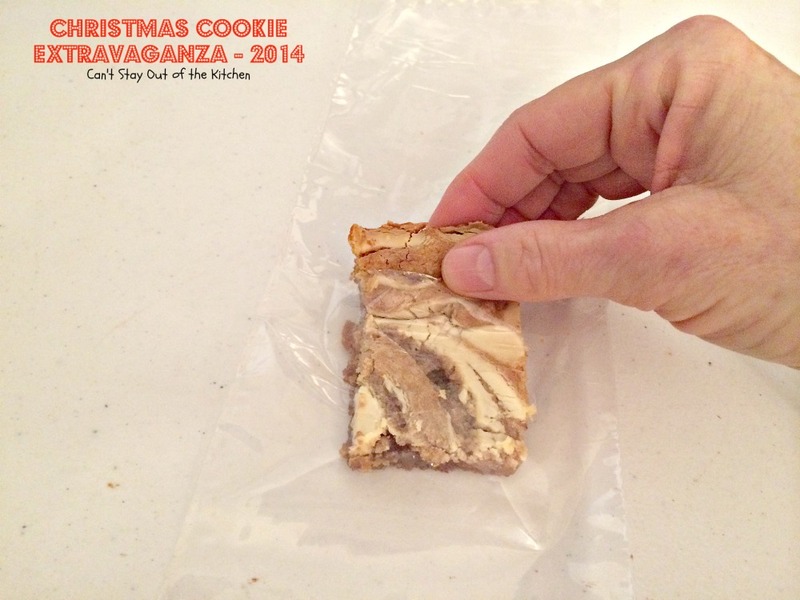 Ten out of 24 cookies we made this year were remakes. I also tried several new recipes, as well as remaking old recipes in new ways to use up ingredients I had on hand. We bag each cookie or brownie individually, then we put the bags through a heat sealer. 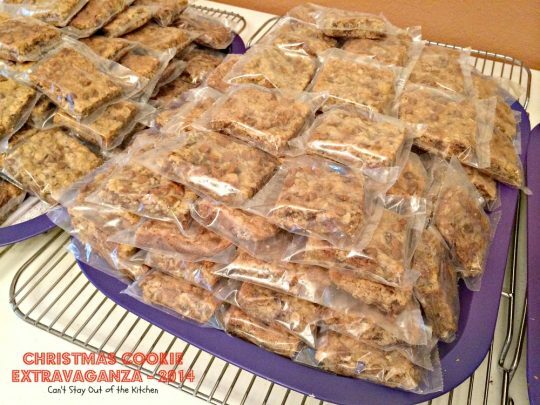 We apply the cookie labels on the back of each bag and then stuff the cookies into zip-lock bags because we can stuff more of them into our freezers that way. I have one large upright freezer, and 3 refrigerators that also have freezers. The freezers were packed to the gills with that many cookies. 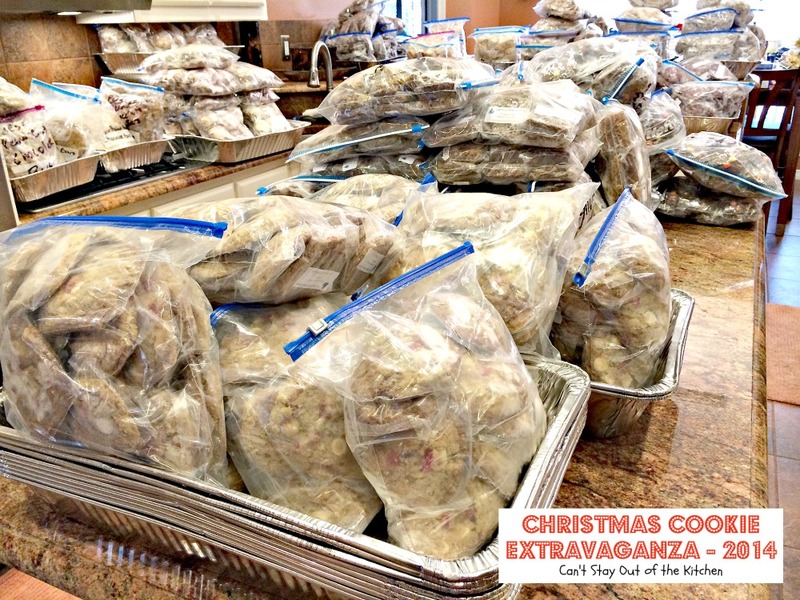 I had enough room to pack another couple of bags with 35-50 cookies each and that was it. Every bit of space was used. 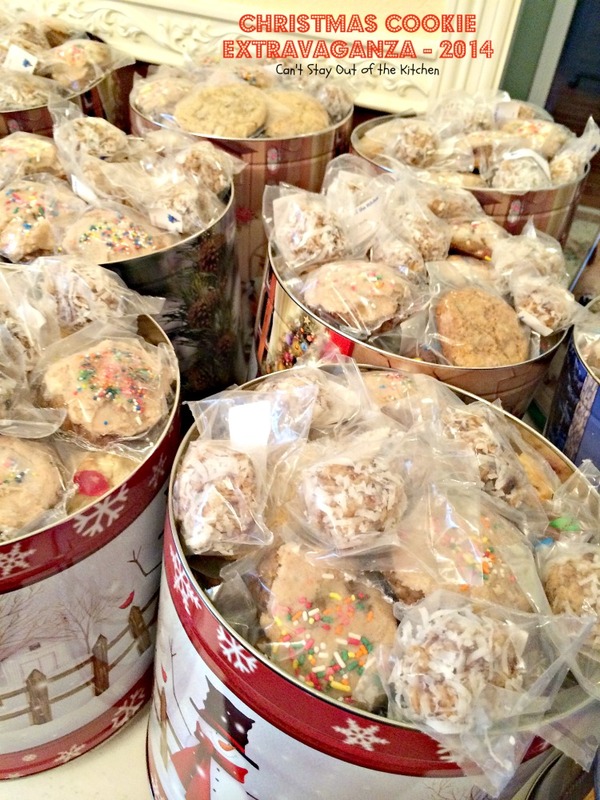 Then once all the cookies are baked, I schedule a day to pack up all the cookies. All the cookie tins, trays and buckets are washed, then placed on every available table. It usually ends up being about 100. 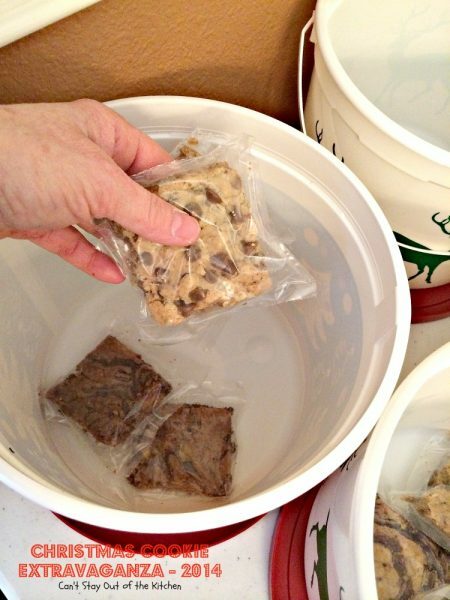 I start with the brownies and put them on the bottom of the containers first because they will absorb the weight of all the cookies being stacked on top of each other better. I started around 9 in the morning and it took me until the end of daylight before I was done packing all the buckets and trays. I get in about a 10-mile walk in the process! 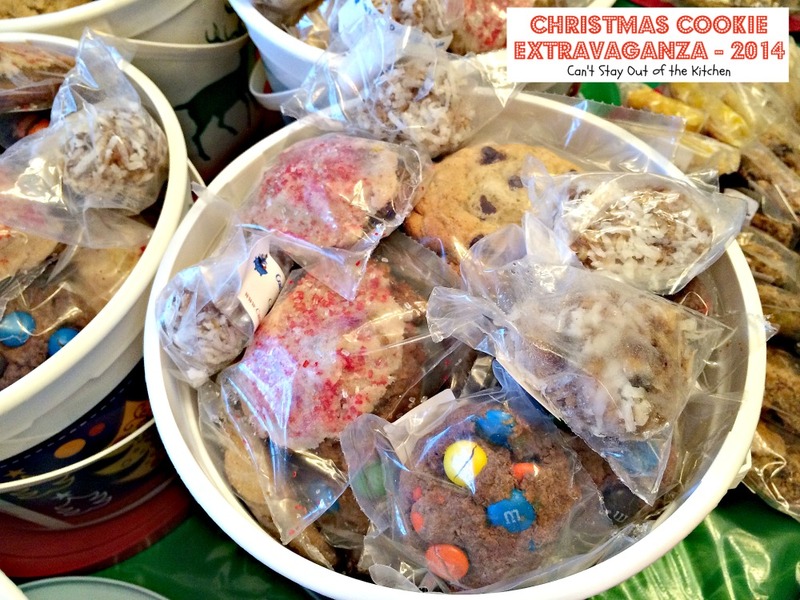 After all the cookies are packed in the containers, I include a recipe flyer so anyone with food allergies can pick and choose which cookies they want to eat. Then I add the name labels on top of each container or tray to route each one to the right folks and then they’re ready to go. Those that aren’t packed for shipping, or taken to work places or friends immediately, are put back in the freezer to stay fresh until we’re able to make deliveries. 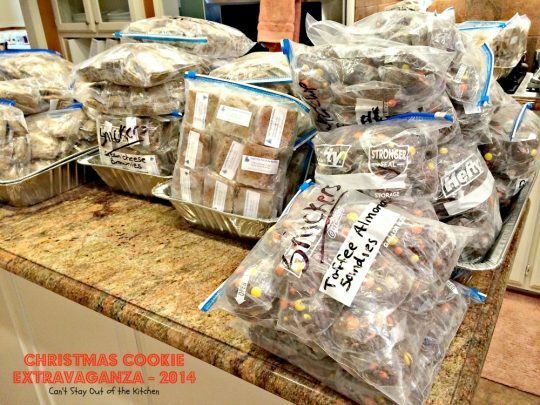 In order to pull off our Christmas Cookie Extravaganza – 2014, I spent about three solid weeks working anywhere from 10-14 hour days, preparing and baking the cookies, taking pictures, bagging and sealing the cookies, then labeling them and putting them into the freezer. For someone who isn’t used to being on their feet that long each day, it was rather exhausting. I was one tired puppy when I was done with this project! No, I’m not 20 any more with lots of energy! In the pictures that follow, I’ll show the process first, then I’ll include links to the 24 different cookies we made with any additional comments. 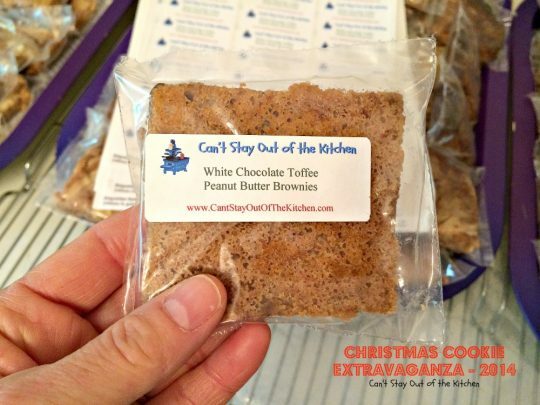 I hope you will consider trying some of our cookies. I also have some excellent choices from 2012 or 2013. 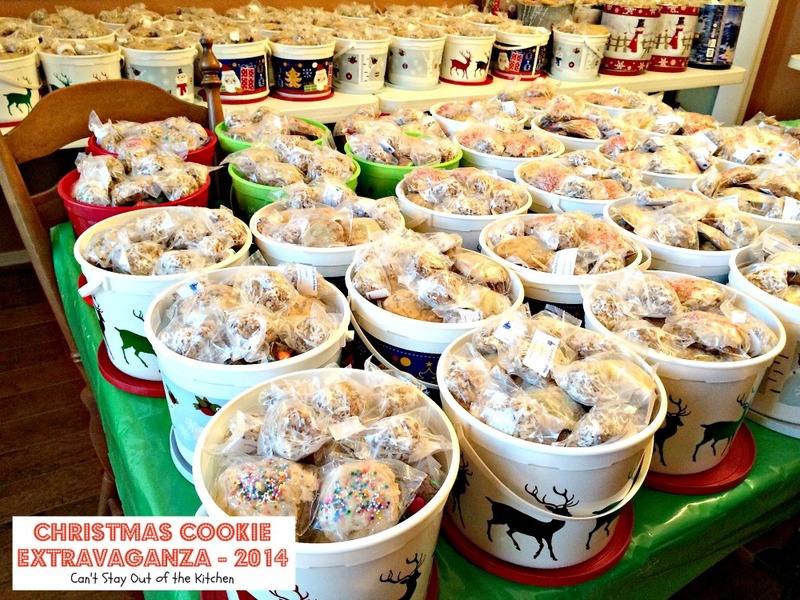 Start with a batch of cookies. These Pina Colada Cookies were highly rated. Unroll the poly bags. Place the cookie or brownie in the bag. 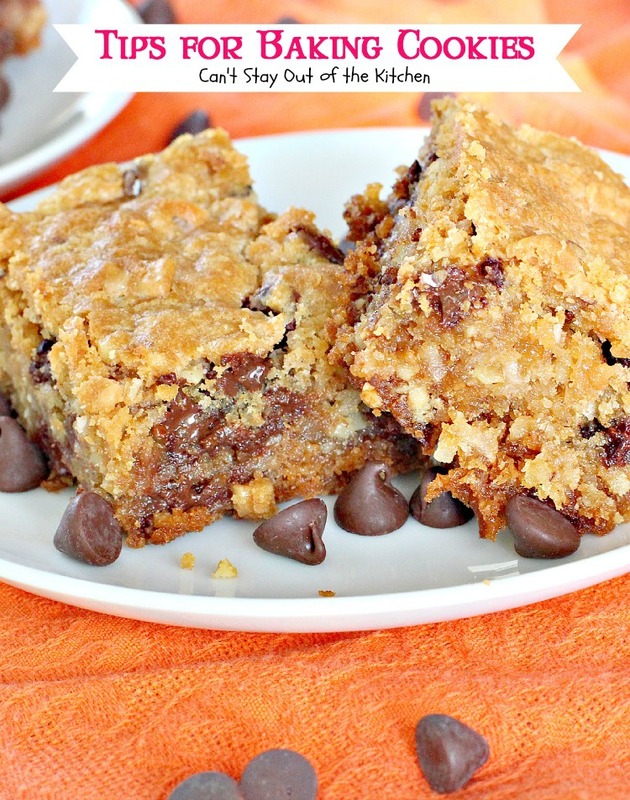 This is a Cinnamon Chip Oatmeal Raisin Bar. We had a lot of rave reviews over this one, too. This is a White Chocolate Toffee Peanut Butter Brownie. Slide the brownie into the bag. 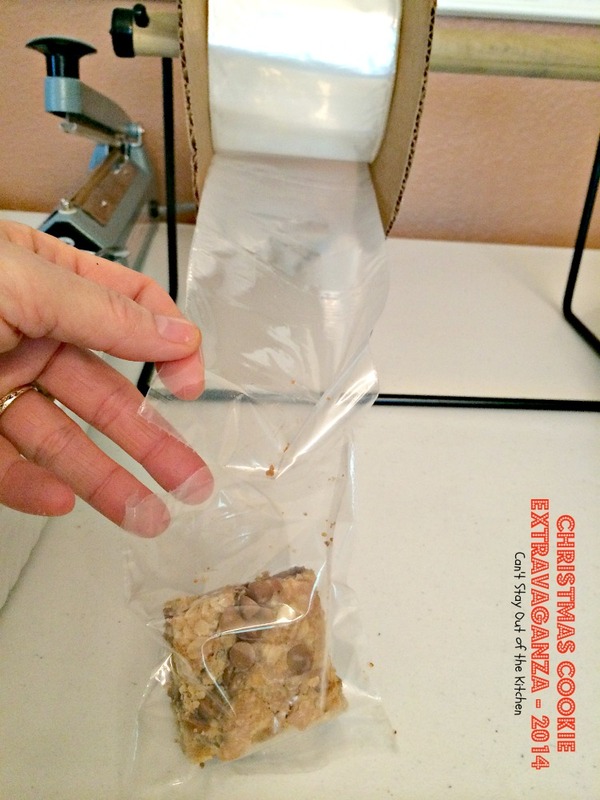 Tear the bag off along the perforations. 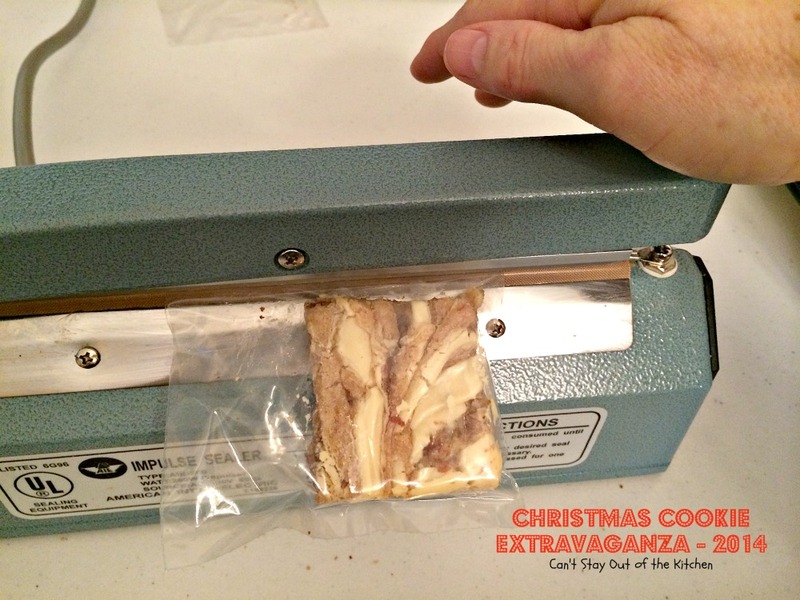 Place the bag under the heat sealer for a few seconds. Tear off the top part above the seal line. This is what the seal line looks like. Here is a tray of White Chocolate Toffee Peanut Butter Brownies ready to be sealed. Here’s the tray after the cookies have beens sealed in poly bags. Then I print labels for each cookie. We went through a LOT of labels. 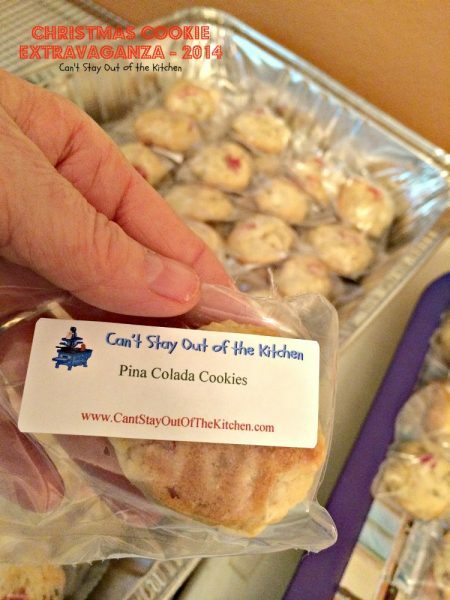 Add the label to the back of the cookies. My cute little logo was designed by a young teenager in our church who’s going to art school in Chicago this fall. She’s amazing. This was the first time I did labels. It was a lot easier for people to figure out what each cookie or brownie was, but it added a lot of extra man hours! 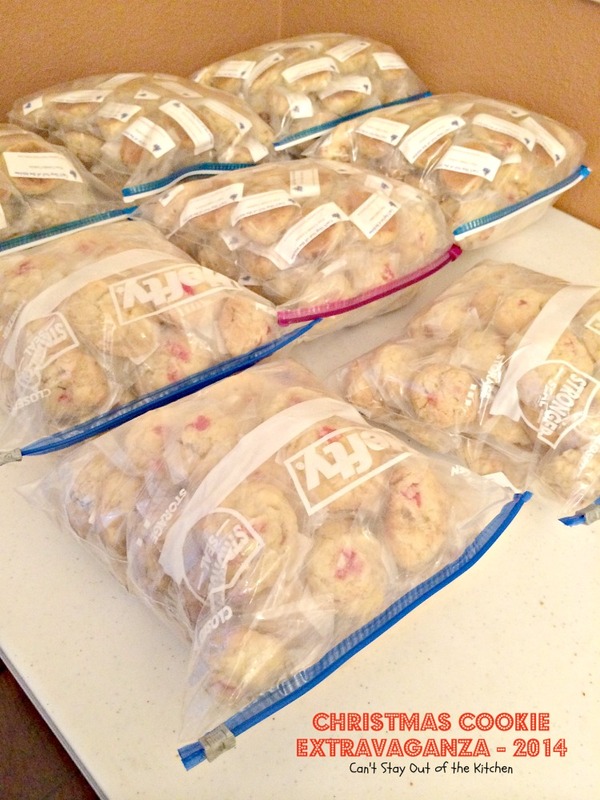 Here the cookies are bagged, sealed and labeled and ready to be put in zip-lock bags for the freezer. Now the cookies are ready for the freezer. 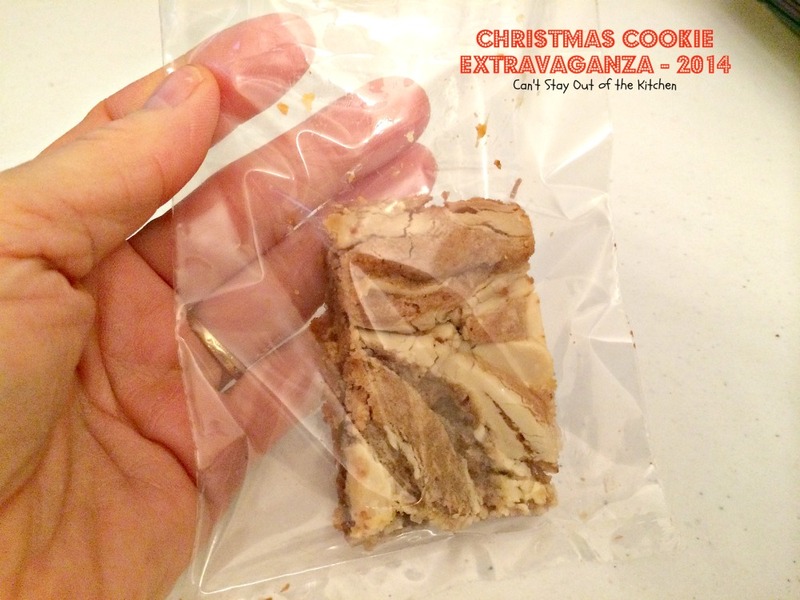 I had them in the freezer about two-three weeks before I was ready to pack them up after Thanksgiving. 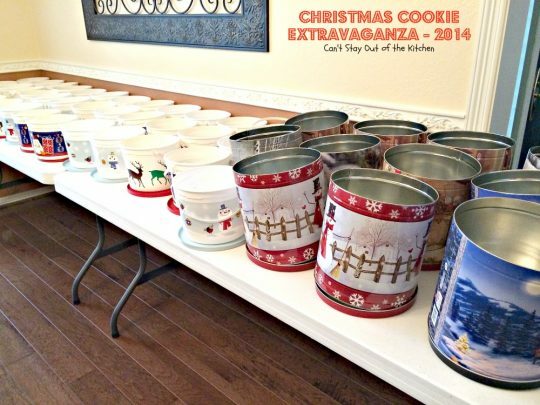 Here I’m ready to start packing the cookies into the trays, buckets and tins. 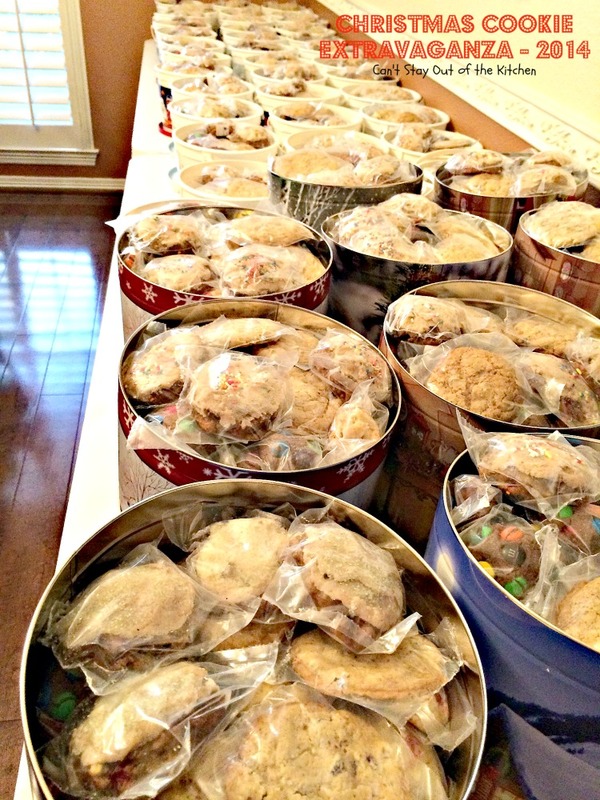 All the cookies are hauled out of the freezers and placed on every available counter space in my kitchen. 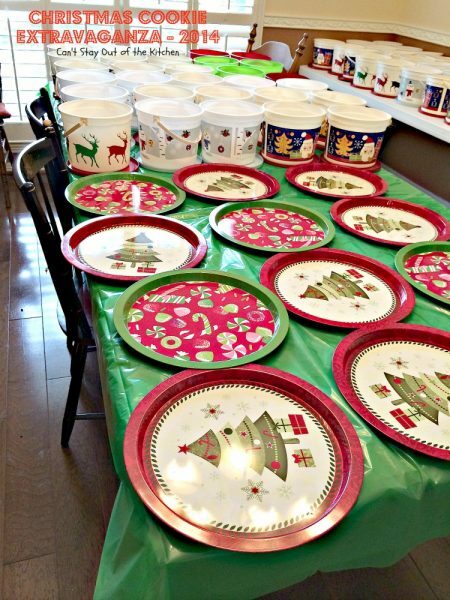 Here are some of the trays and buckets. I also have my kitchen loaded with about 20 trays, and about 20 more in the room behind where this picture is being taken. 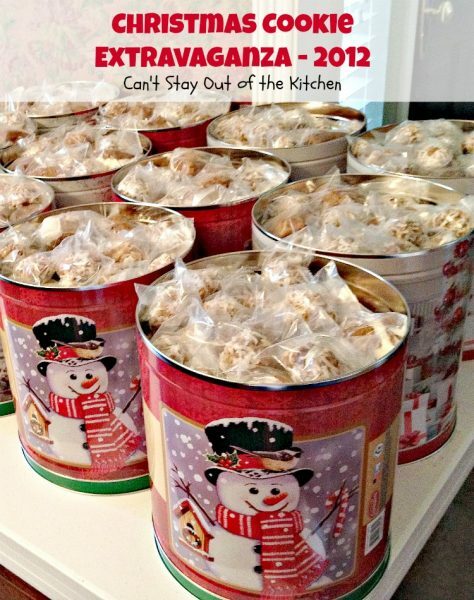 Here’s the popcorn tins and buckets. The buckets get at least two of everything. I start by placing all the brownies on the bottom so they absorb the weight of the cookies. Cookies that are fragile or with icing always get placed on the top of the other cookies in the containers. 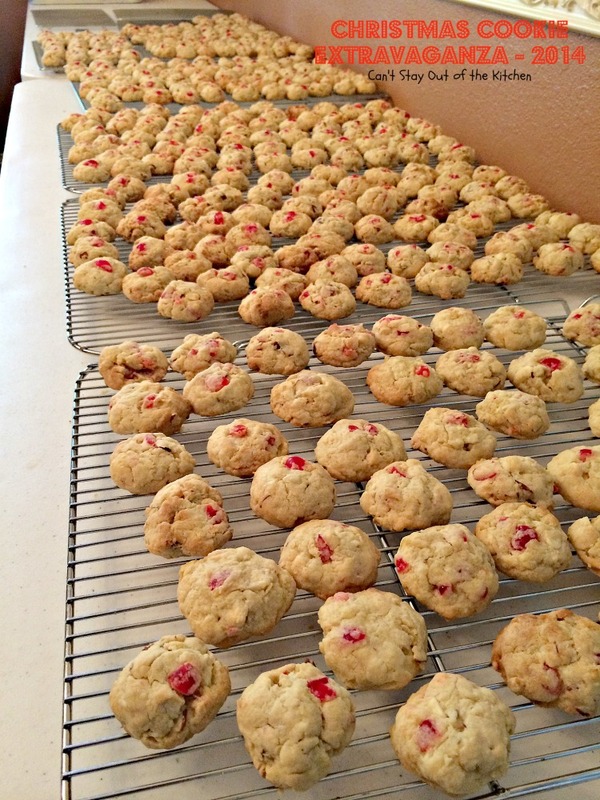 Here are the cookies before adding the Coconut Date Balls. Here the buckets are packed. Here are some of the trays. We send a lot of trays to service providers and for different departments at John’s workplace. 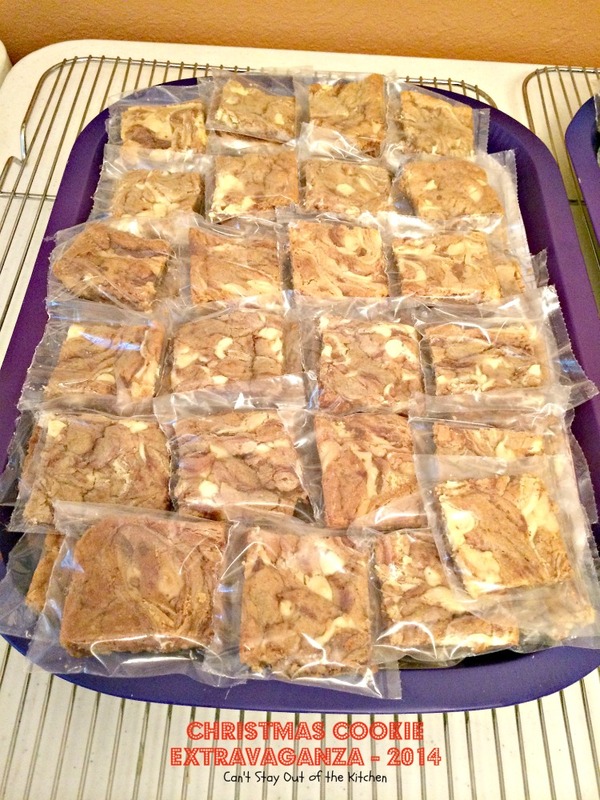 We wrap them up tightly with plastic wrap for delivery. All these buckets take a LOT of cookies! I try to wedge the cookies in carefully so they fill the buckets. We’ve always liked to fill our Christmas buckets with a wide variety of cookies. 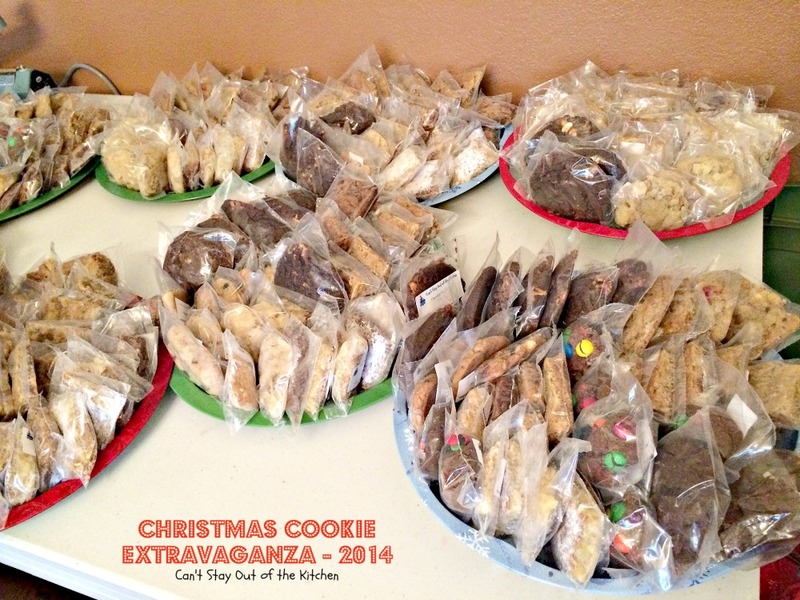 Now I’ve added my recipes and tips for baking the cookies. 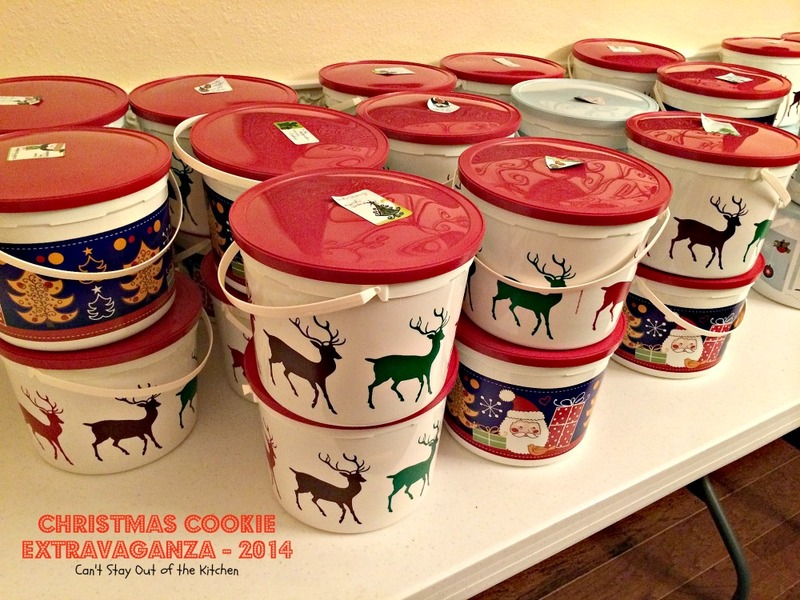 Put the lids on the containers and add name labels! Get ready to ship or deliver the goodies. 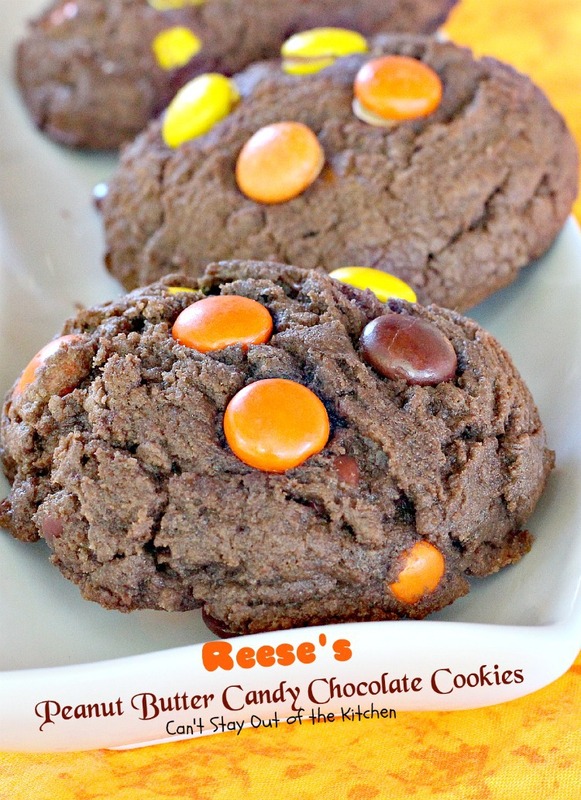 My husband loved these cookies, and he wasn’t alone. A lot of folks enjoyed having a cookie with blueberries! 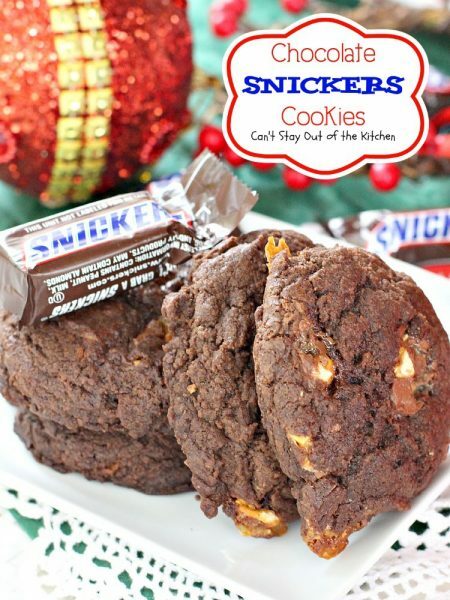 Who can resist cookies made with Snickers bars? We had rave reviews over these. They are so rich and sweet. This was one of my personal favorites. But that’s because I enjoy icing on cookies and I love cinnamon. 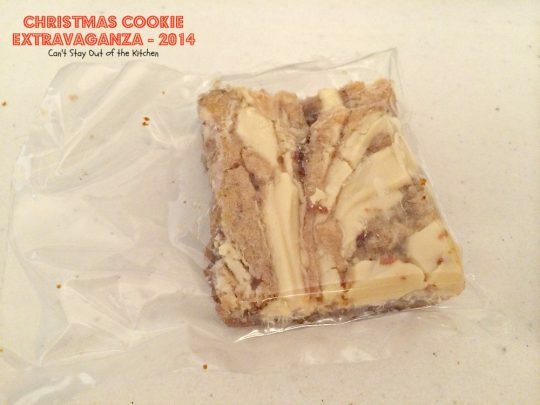 We had a lot of people tell us this was their favorite goodie this year. These cookies are incredible anytime we make them. 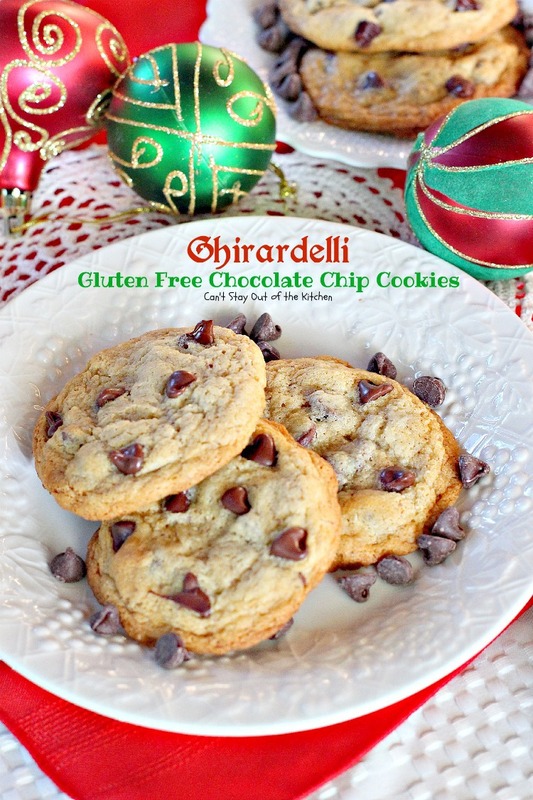 Everyone really loved these gluten free cookies. Even though they are a crunchy cookie rather than a soft and chew cookie these were one of the most spoken about cookies this year. No one could believe they were gluten free. These are my number two son’s favorite cookies. 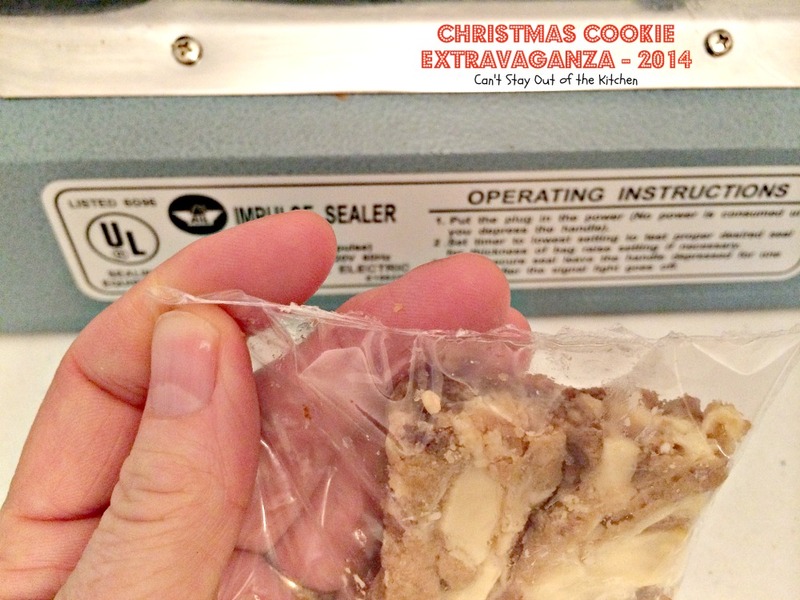 After all the work he did getting my blog transferred to a more dependable blog hosting service I had to make his favorite cookies, though this was unplanned when I started Christmas Cookie Extravaganza – 2014. 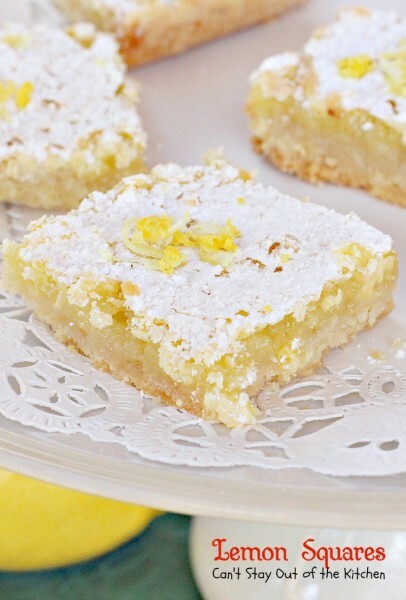 I also made extra bars and sent my son his own bucket of just lemon squares! Who doesn’t enjoy a cookie with M&M’s? These turned out so wonderfully. I loved these. 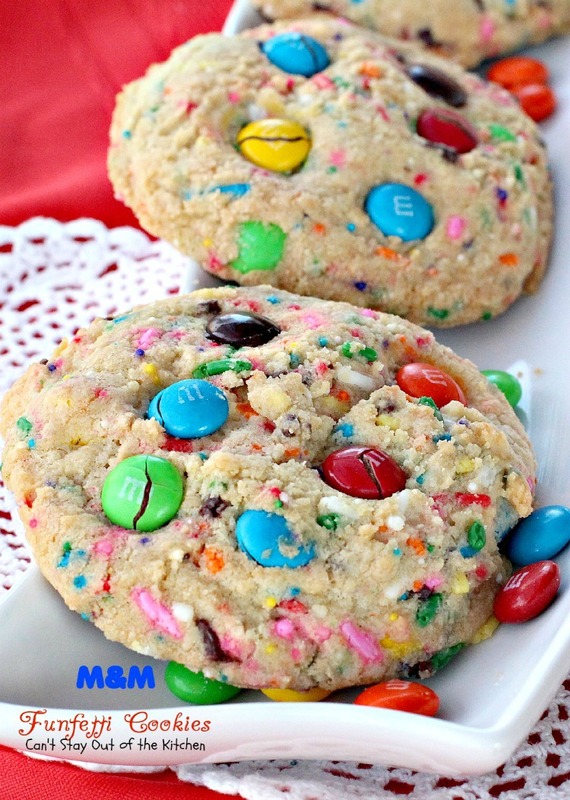 These got rave reviews when we sent them as extra cookies to John’s office staff. 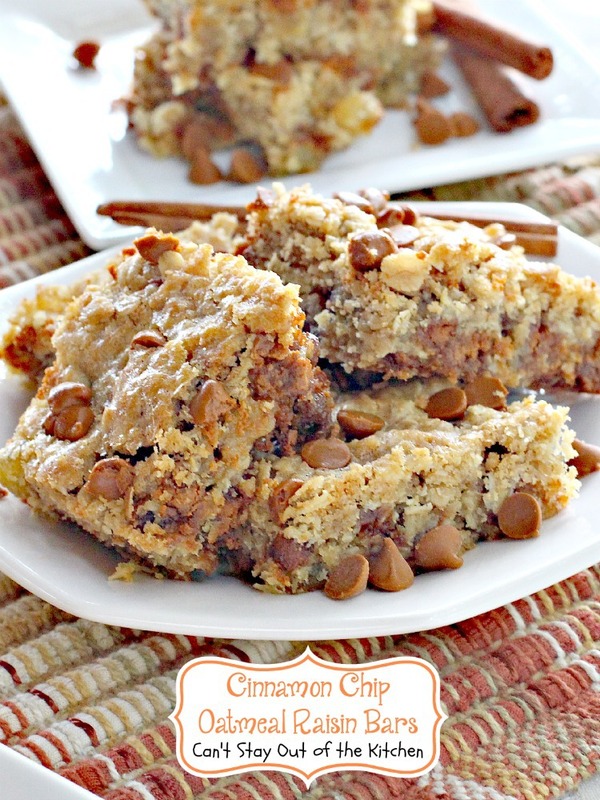 These have always been a family favorite and they’re so quick and easy to make up. This new creation was one of everyone’s favorites this year. 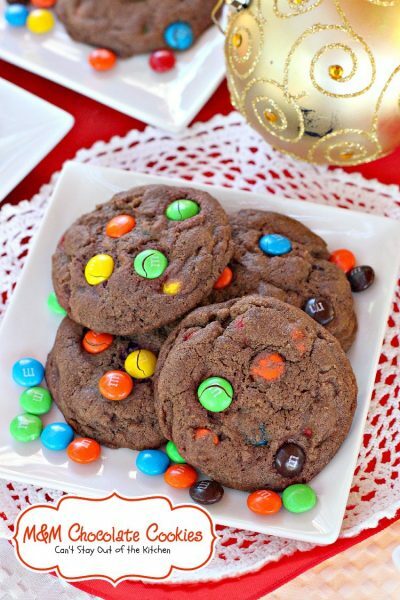 These cookies got the most raves over everything I made this year. 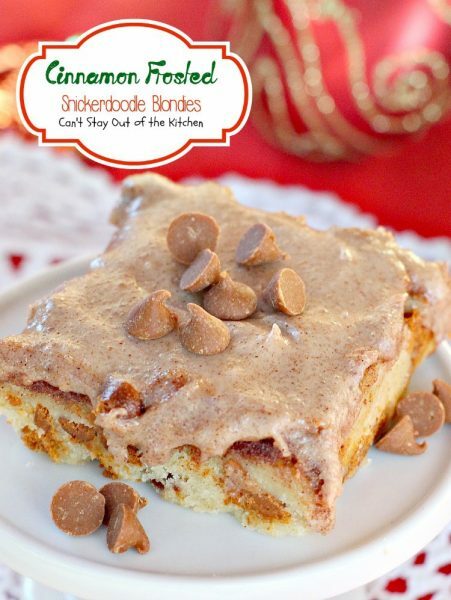 Everyone loved having the cranberries in the pumpkin cookies. This brownie is lovely with the tasty lemon buttercream icing on top. 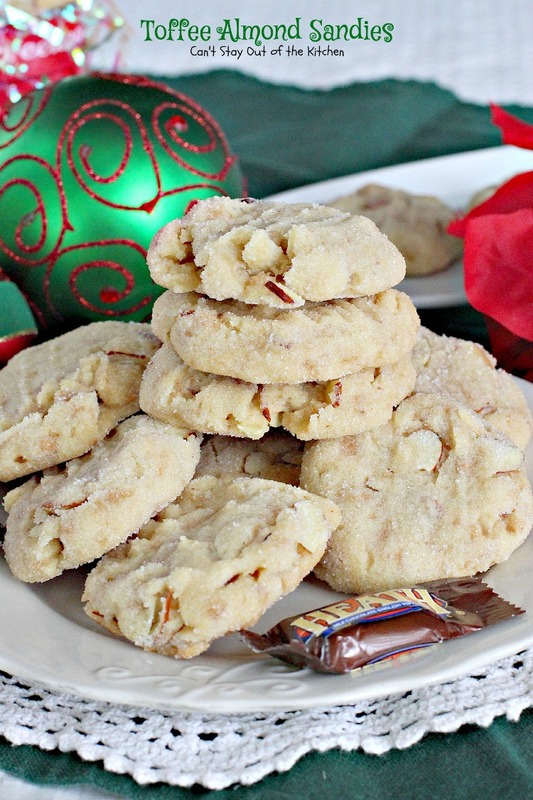 Red Velvet Crinkle Cookies are always favorites. 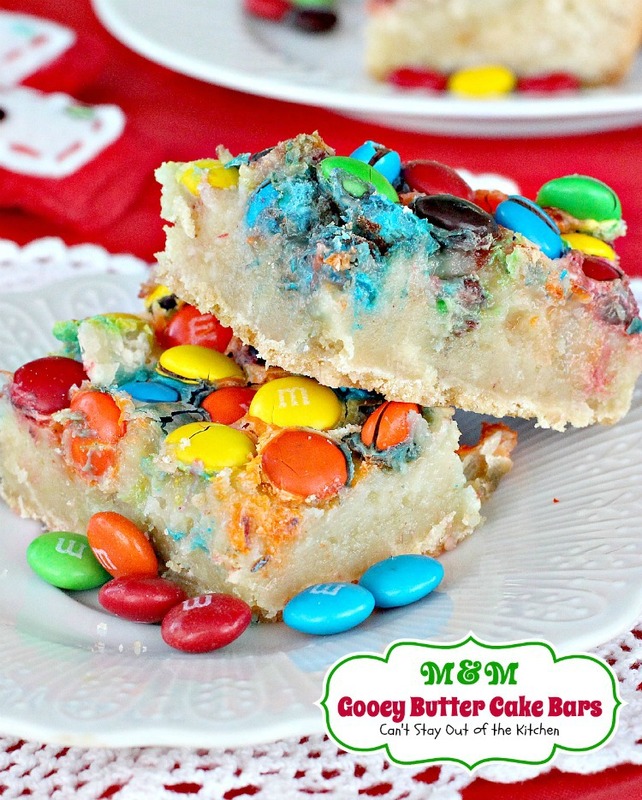 These spectacular brownies were also raved over big time. 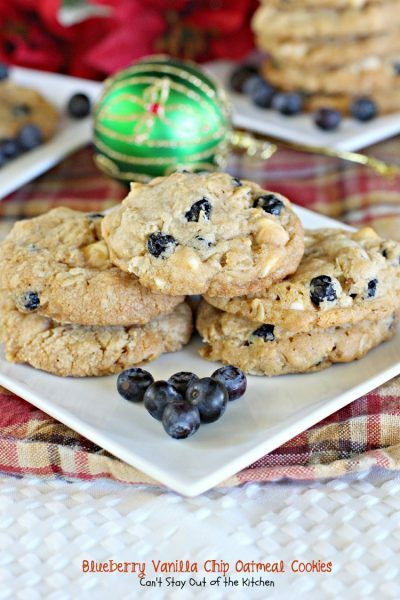 They are such drool-worthy cookies! 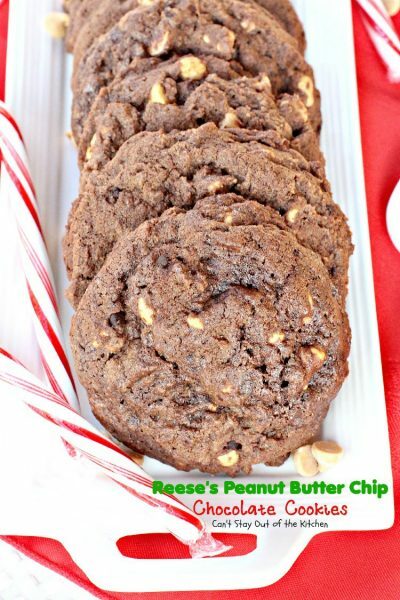 Peanut butter and chocolate just go so well together and I made a lot of peanut butter and chocolate combinations this year. Here’s another peanut butter and chocolate cookie! We have made this one lots of time over the years. This is another of my personal favorites. 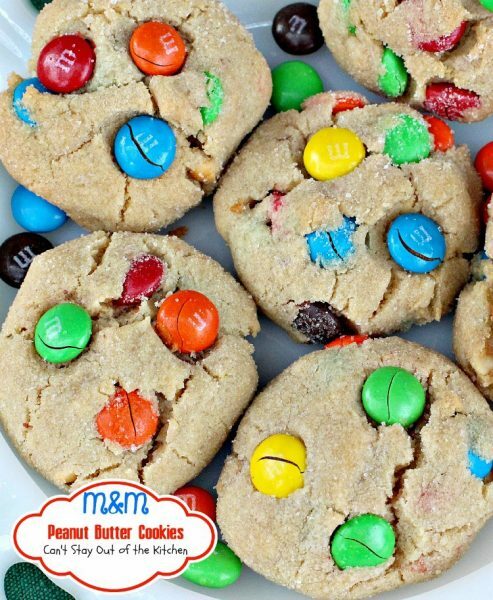 These cookies rock. 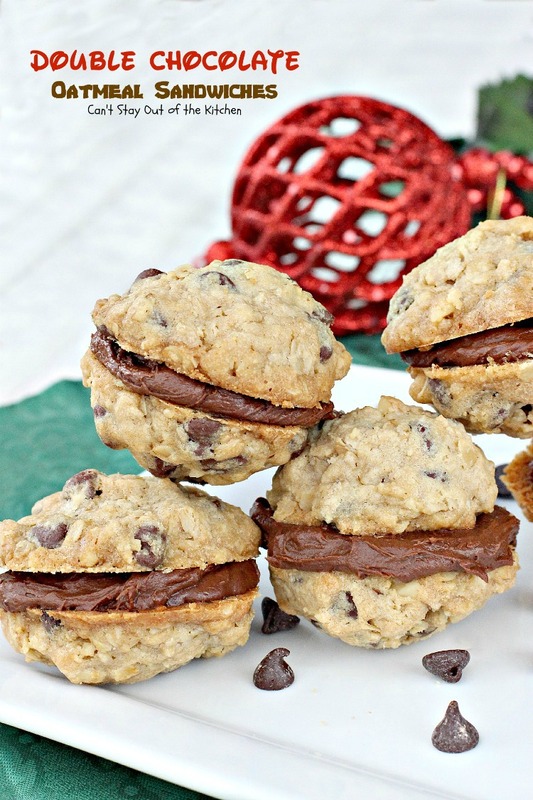 I’m one of those odd balls that prefer cookies without chocolate most of the time. These cookies were also very well received. If you enjoy cherries they’re a dream. These were also highly touted my many of our friends. How do you frost the cookies/bars and then bag them without the frosting sticking to the bag. 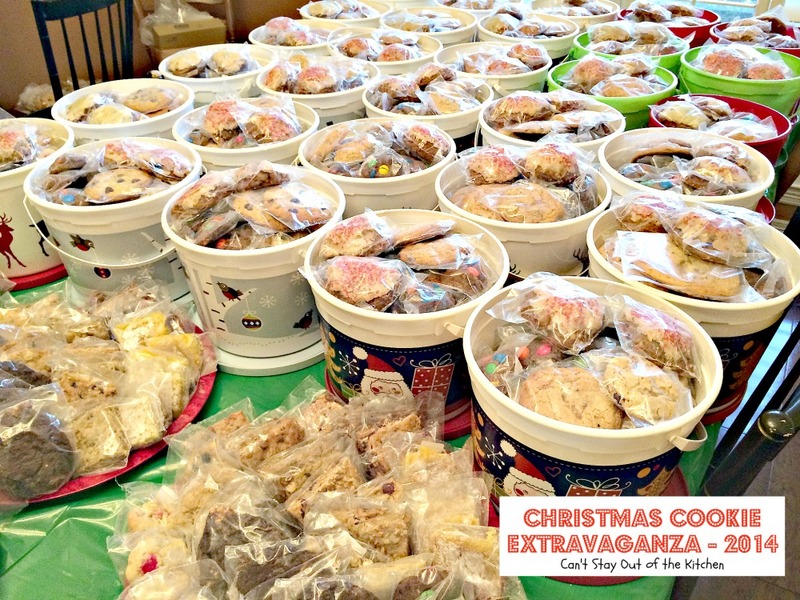 Do you freeze the frosted cookies as well and if so how is the consistancy of the frosting after freezing? Hi, Miriam, I’m so glad you stopped by my blog. 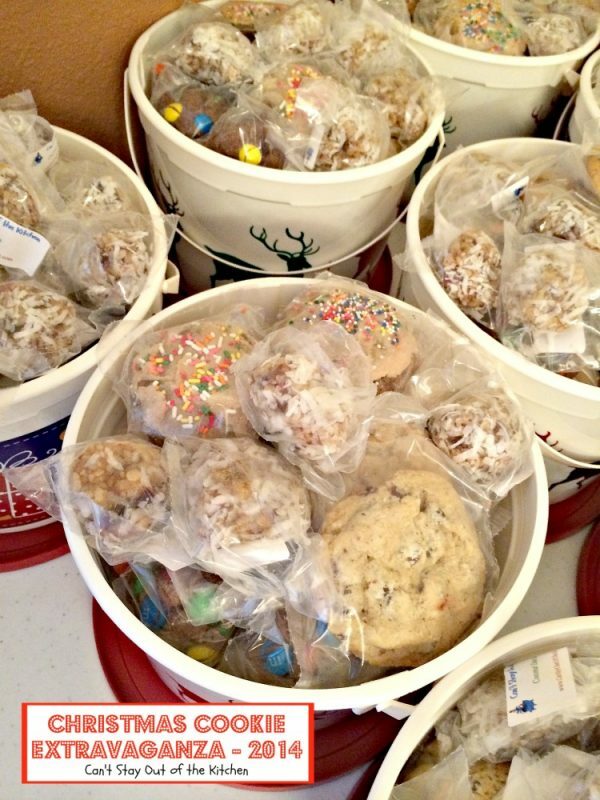 I allow the frosting to dry on the cookie about 30 minutes before bagging them up. (It does help when there are sprinkles on top, but I don’t usually put sprinkles on top of every iced cookie. 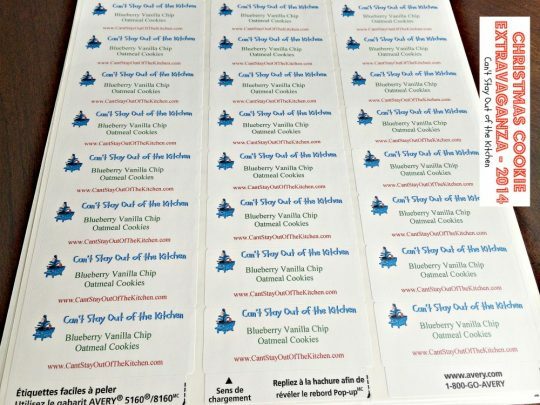 We do routinely freeze some of the gooey bars or ones with icing on top before cutting and bagging as it really does help the process go a lot smoother. 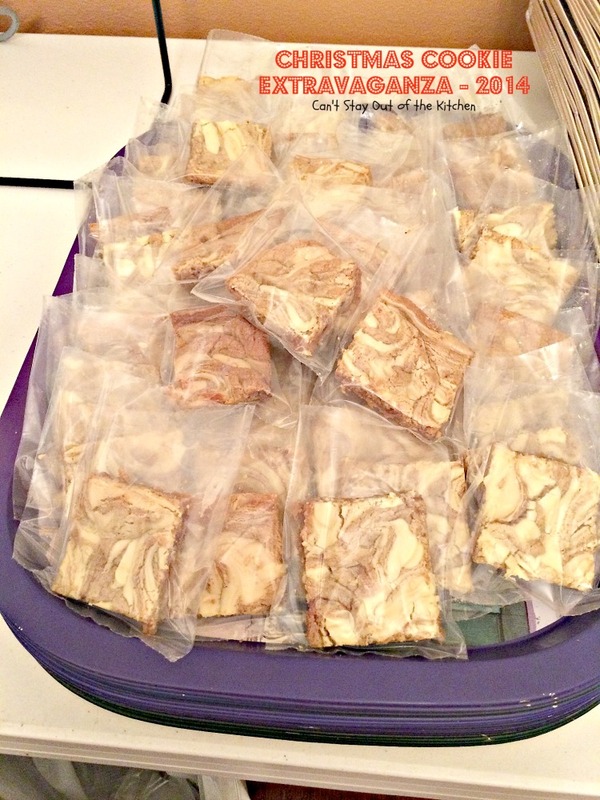 Sometimes the bags do get gooey and I have to double bag them or wipe icing and goo away as I’m bagging. Usually we have more difficulty with melted chocolate chips rather than frosting. The frosting tastes fine after freezing. We’ve never had any problems. Almost in every case, it’s the frosted cookies that everyone raves over the most each year.